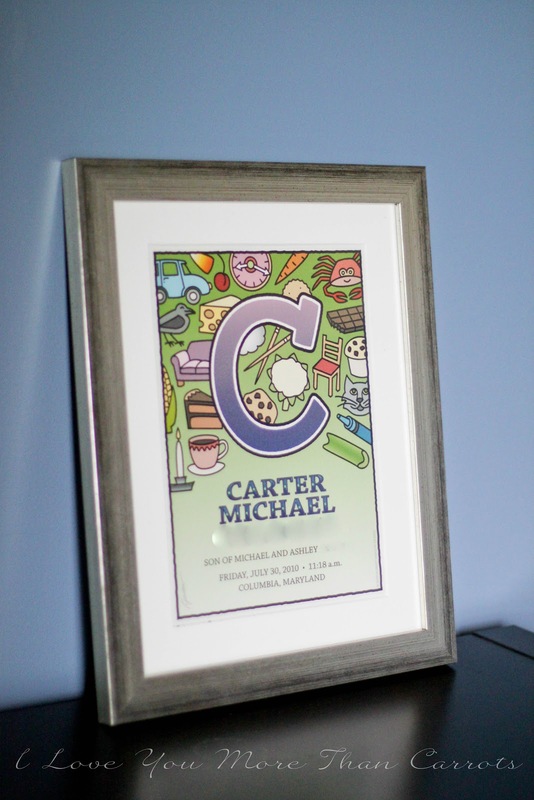 I Love You More Than Carrots: Incredible Custom Baby Name Artwork And Giveaway! Whether you've been reading ILYMTC for a week, several months, a year or even three years, then you're well aware of my love affair for all things personalized. From accessories to print work to kids' clothes, it's an obsession I freely divulge. This is precisely why I am so excited to share with you the work of a family friend of ours, Robert Saslow of BABY-CDEFG. "Robbie" is the creative and artistic genius behind so many wonderful and beautiful design pieces. As seen on his website, "Robert Saslow is a Los Angeles-based calligrapher and designer who comes from a family of artists. He earned a degree in 2-dimensional art from California State University, Northridge (1986). He has extensive experience teaching art, including over 20 years at Los Angeles schools, and nine summers on the art staff at UAHC Camp Swig in Saratoga, California. He is an active member in the Society for Calligraphy, and his work has been published in the Letter Arts Review, a leading calligraphic journal." You can visit his online gallery here (http://www.robertsaslowdesign.com) to see just a handful of some of his incredible works of art including but not limited to ketubah prints, invitation and announcement design as well as my personal favorite, custom baby-naming personalized certificates. Recently, Robbie gifted our family a custom BABY-CDEFG piece for Carter and I just love how it turned out. Sweet M2 hasn't even arrived yet and already I cannot wait to commission Robbie to create a piece for our second sweet son as well. This particular piece of artwork features baby’s initial surrounded by charming illustrations of objects that begin with that letter. There is a different design for each of the twenty-six letters of the alphabet, and each design is available with five different background colors. Robbie is so incredible to work with- very patient and quite helpful as he worked with me to decide which colors would look best on Carter's extra special piece of art. This particular piece arrived in pristine condition, safely preserved on a piece of French watercolor paper, already matted and ready to be popped into a frame. Within days I had it hanging in the perfect spot in Carter's room. It goes without saying the amount of hard work, love and dedication Robbie pours into each of his custom pieces. I am honored to have a piece of his work hanging in our home and so happy I had the opportunity to work with him. These pieces would make excellent gifts with each new addition to a family and I'm excited to add Robbie to my List of "Newborn Arrival Gifts!" Graciously, Robbie has offered up ONE special custom BABY-CDEFG piece of artwork to one lucky ILYMTC Loyal. 1. Leave a comment below telling me how much you would love to own a piece of Robbie's artwork. Winner will be chosen Friday, May 4th after 6pm. Thank you so much for entering and Robbie, thank you so much for sharing not only your creative touch but your inspiration and love of art with so many! Um yes. Kinley needs this and Sutton will need this as well. How cute! This is so cute and would be a great piece of art for our playroom! Oh yes Hudson's bare walls need this! Oooh I seriously need this for baby #2's nursery! I have been online for hours looking at artwork...I would love this for his nursery! I have been wanting something for Grayson's new room that is personalized and have been stumped! This is perfect! I love, love, LOVE this! It would be a perfect addition to my daughter Harper's nursery!! I love all things personalized and this is so unique! too precious! like any good southern girl, I can't get enough monogrammed or personalized decor! Gray has a personalized print in his room, but Logan doesn't. It would be perfect in our new house!! Fun! I would like very much to have a special "J" edition for my 1-year-old! This would be awesome to win! So cute! I love all things personalized and this is darling! I would love to win this...but for my sister is is pregnant with her first child...this would be a great gift! My husband and I are expecting our first baby in December!!! I'd love to hang this in our nursery!!! I'd love this for my little guy! When I picked out baby names, I never realized how unique they are, because I can't find ANYTHING with Meredith's name on it...seriously. So this would be wonderful to put in her room!! That is too cute! I would to be able to add that to my daughters wall! I would love, love, love this for our new baby! It would look perfect over the glider in his nursery. This is so adorable and would be great for our son or as a gift. Great giveaway! gorgeous! would love one for my baby girl! This is amazing! Would love to gift one to my bestie and her little man! So cute. How fun! Of course I would love a custom piece for E's room! This would look so cute in the playroom! Love these! We need some new artwork for walls when we move to our new house. I need to have one of these for my son Owen...would look great in his room! That is SO cute! I would love it. Oh eff that is cute. The little crab in the corner is killing me. I need to procreate STAT... Giddy up ovaries!!! This would be amazing for my sister who is due with my nephew in June. Wouldl love to be able to give this to my brother and sister in law. They're expecting this month! I would love one for my little Sawyer! Oooh I'd love to win one as gift for my best friend who is expecting! That is awesome! E needs this!! My six month old's room is in desperate need of some cute artwork- and the personalized name is perfect! We would proudly show off the creation! What a great giveaway! 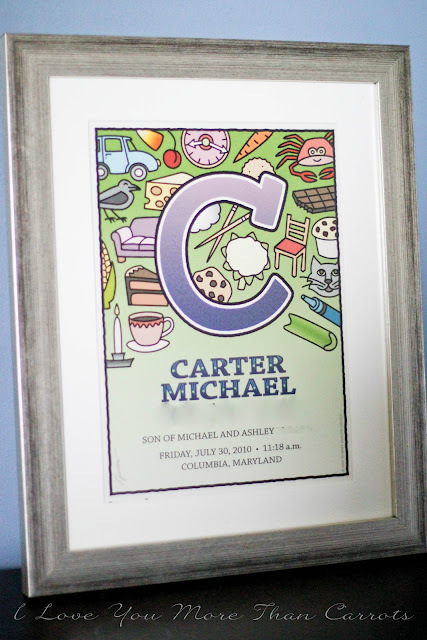 I love this "C" art, which would be great for my son Colt. Also, I share a birthday with your sweet Carter! Wow these are so cute, just perfect for a nursery. This would be so fun to have in my daughter's playroom! This would be so neat for my daughter's playroom!